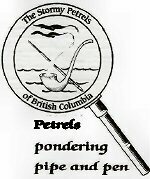 Twenty-five Stormy Petrels and guests met in the fireplace room at the White Spot in Vancouver to celebrate the 164th birthday of the world’s first consulting detective. Sheila, our Stormy Petrel member from Seattle, read out a letter* which she had received (on behalf of our group) from the Grimpen Postmistress. *a copy of which will be reproduced in the next Petrel Flyer. Our dear Seattle friend, Margie, joined us sporting her very special broach! Bob read an excerpt from his essay published in Chris Redmond’s “About Being A Sherlockian“, entitled “The Adventure of the Multiplying Friends”. Once again, the three “Sherlockian Musketeers” got together for another photo op! Elsa collected membership dues, and Fran collected names on her list for toasts for the Masters Dinner in March. The Petrels will meet for their regular study session on February 6th. The adventure for discussion will be “The Red Circle“. (7:00 pm at our usual Hampton Place lounge) Additional details will be posted soon.